Ramsey has won the FA Cup three times and the Community Shield once during his time at ArsenalAaron Ramsey is a footballer who divides opinion like few others.Revered by Wales fans but regarded as an unfulfilled talent by some Arsenal supporters, with Ramsey the truth usually sits somewhere in between the polarising views.A number of Europe's leading clubs appear to share the Welsh outlook, as Real Madrid, Bayern Munich, Paris St-Germain and Inter Milan had all shown an interest in the midfielder, whose contract at Emirates Stadium expires in the summer. 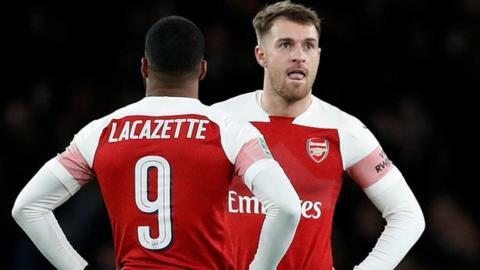 By most players' standards, Ramsey has enjoyed an excellent career at Arsenal since joining from Cardiff City as a 17-year-old in 2008.Yet despite scoring 61 goals in 359 games - including the winners in the 2014 and 2017 FA Cup finals - there is a sense that the Welshman has never truly won over certain factions of the Arsenal support.That may be borne out of frustration, a feeling that Ramsey has not consistently scaled the heights which saw him named in the Euro 2016 team of the tournament after playing a stellar role in Wales' run to the semi-finals.So, has he been fully appreciated at Arsenal? "Maybe not," former Arsenal striker Ian Wright told BBC Radio 5 live. "He's one of those players who no matter how poorly Arsenal were playing he never hid, always showed for the ball. "He got loads of stick but continually tried to play and in the way he wants to play football. We are losing a great player and it's a shame. "Ramsey has not been at his sparkling best this season, though that is largely due to a lack of game-time caused by his contract dispute with Arsenal and subsequent inability to secure a regular starting place in the team.Even before this season's doubts about his future, however, Ramsey has been criticised by Arsenal fans at matches and on social media. "They've never fully taken to Rambo - there's always been a section of fans," says Ramsey's former Wales team-mate Danny Gabbidon.Gabbidon's view is representative of many in Wales, who have taken umbrage at the criticism Ramsey has faced at Arsenal, be that from fan websites or celebrity supporters.His detractors may point to a lack of consistency - he is as likely to dominate and transform a game as he is to pass through 90 minutes almost unnoticed.There are times when he has been anonymous for Wales but his supporters there hold a more sympathetic view, that a fluctuation in form is a hazard of the job for a playmaker.Another former Wales international, Iwan Roberts, believes that to be the case - and that Arsenal will come to regret their treatment of Ramsey. "They haven't appreciated him from the first day he walked through the door," he said. "We [in Wales] would rather see him go to Juventus. He could do with a fresh start." Juventus will make Ramsey the highest paid British player of all time with a basic salary of just over £400,000 a week and, like Gabbidon, Roberts thinks the midfielder will suit the more patient playing style of Serie A.The man who gave Ramsey his Wales debut back in 2008, John Toshack, also believes Ramsey could be revitalised by the change of scenery.Toshack has managed several foreign clubs - including two spells in charge of Real Madrid - and the former Liverpool striker hopes Ramsey will embrace all aspects of his move to Italy. "There's a great deal to be gained by going abroad and seeing how other people live, not just the football, the culture side of it, everything," he told BBC Sport Wales. "It makes you a better person overall and Ramsey now is at an age where he should be ready to cope with these things. "Juventus is a big club, they're expected to win things, Champions League, and everything. "He should really have a fantastic three, four maybe five years ahead of him, and, hopefully, the Welsh national team will benefit by that as well and it won't be easy adapting. "If it can seem that the Welsh footballing community is protective of Ramsey, then it may well be because it is.He is a treasured rarity in Wales, a country which has seldom produced a player of such creativity and guile during its history. "They have Emre Can, Sami Khedira, Miralem Pjanic, Blaise Matuidi - none of those are players who get in the box and have that goalscoring threat, so I'm sure that's why Juve have identified him. "Juve are dominant so he's going to be winning league titles, but Serie A is becoming more competitive with Napoli and Inter Milan competing again."